Ten days ago, we told you about a new global car brand Chinese automaker Geely is planning to announce next week. The brand, cringingly called Lynk&Co, is making big claims about being something revolutionary. So far, it seems to be a Volvo-platform SUV with some possible bike-sharing stuff? And a cloud? What The Hell Is Going On With This Mysterious New Car Brand? Last week we just had that teaser shot of the grille; now we have peeks at the side-marker lights and the upper C-pillar, from this little video. The video also hints at what’s likely to be thought of as the ‘game-changing’ aspects of the car, represented here via a cloaked smartphone, bicycle, and floating cloud, likely a symbol for the internet “cloud.” Or maybe on-demand precipitation. 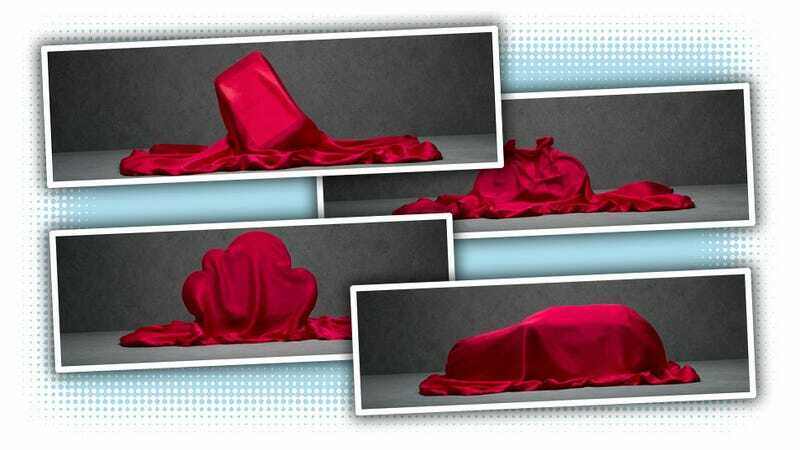 The car under that luxuriant crimson sheet is based on the Complex Modular Architecture (CMA) platform that Geely co-developed with Volvo. According to Automotive News, the new brand is likely designed to be a middle market brand, allowing Volvo to focus more on the premium/luxury market. The first Lynk&Co vehicle appears to be an SUV or perhaps a crossover. The bike and smartphone and cloud all canoodling under that sheet makes me think that the brand will differentiate itself by offering some sort of sharing service for buyers, giving them easy access to bikes or public transport or something similar. It’s possible a more robust car-sharing system may be implemented as well, possibly on some sort of subscriber model that let Lynk&Co subscribers get access to cars or bicycles or other mobility solutions, somehow. The car industry spins in circles by doing the same things over and over. Rules and conservative values stand in the way of evolution. We know this, because this is where we come from. Now we have decided to end the game of “follow the leader”. “Time has changed. We live in the connected world and in that world, the heart of a car is not the engine. It’s the connectivity.” LYNK & CO, Senior Vice President, Alain Visser. There’s more to Lynk&Co than just a downmarket Volvo SUV. I’m curious to see what it turns out to be. I hope it’s not a big floating cloud. See you in Sweden and Berlin for all this next week!